I’m up today to share with you my latest layout including a feature title made from the ‘Together‘ background Cut File. I have flipped things a little on this one, and cut the file using patterned paper, and backed it with white card stock. I love how this connects the file with the background because of the repetition of the soft pink colour, yet the white card still really pops the title from the page. To further emphasise the pop of the file, I backed it with foam adhesive. I love how this emphasises the space where the hearts are open inside the letters. I resized the Cut File and made it a little smaller so that my 4×4 photo would tuck in under the bottom right corner. This gave me a few other spots to create some embellishment clusters. I used some of the little hearts that came out of the centres of the title in the embellishment clusters, again giving that connection and repetition. I even sketched around them with a black pen, continuing on an element from the background patterned paper. I am super happy with how this page turned out. Make sure you jump over to the online store or the Etsy shop to grab yourself some of the CTY Cut Files – and remember if you don’t have a cutting machine CTY off Custom Cuts as well! I absolutely fell in love with this cute little squirrel cut file. So I decided he needed a page all to himself! I have cut the Squirrel cut file with my Silhouette. I sized the cut so he would fill most of my 12×12 page. and give it a cohesive feel. I’ve been hoarding this collection for quite a while, but I thought it would be perfect to use the papers with the acorns for the Squirrel! I then backed the cut file with some cardboard to raise it up off the page. collection to finish off my page. He looks so great all framed up ready to hang up on the wall! Make sure to check out the shop, Etsy, Instagram and Pinterest! And check out the Facebook CUT TO YOU HQ group for more inspiration. We love to see what you have been creating with CUT TO YOU cut files. Hello scrappy friends! 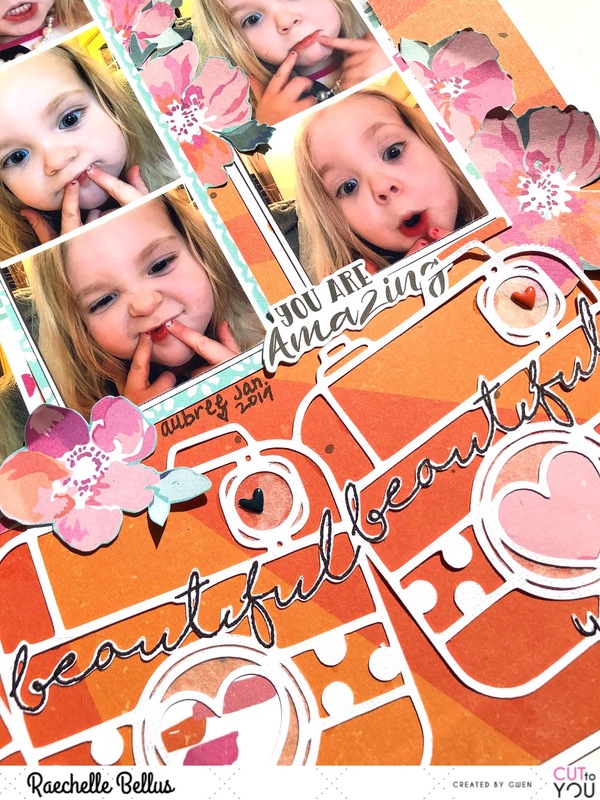 Today I am sharing this cute layout featuring the Camera Beautiful You cut file from the March 2018 release. I wanted this layout to convey a whimsical yet simple feel featuring the camera cut file as a focal point without detracting from the silly photos. I manipulated the cut file to add to the playful feel of the layout. To do this, I duplicated the camera shape three times (each the same size), rotated at different angles, randomly layered them on each other, and then welded into one shape prior to cutting. I wanted to keep the cut file open but with some detail, so tracing the ‘beautiful you’ on each camera carefully with a black marker added a nice punch without being overdone. Adding some patterned paper and/or tracing paper was also good for a visual effect without being overpowering. 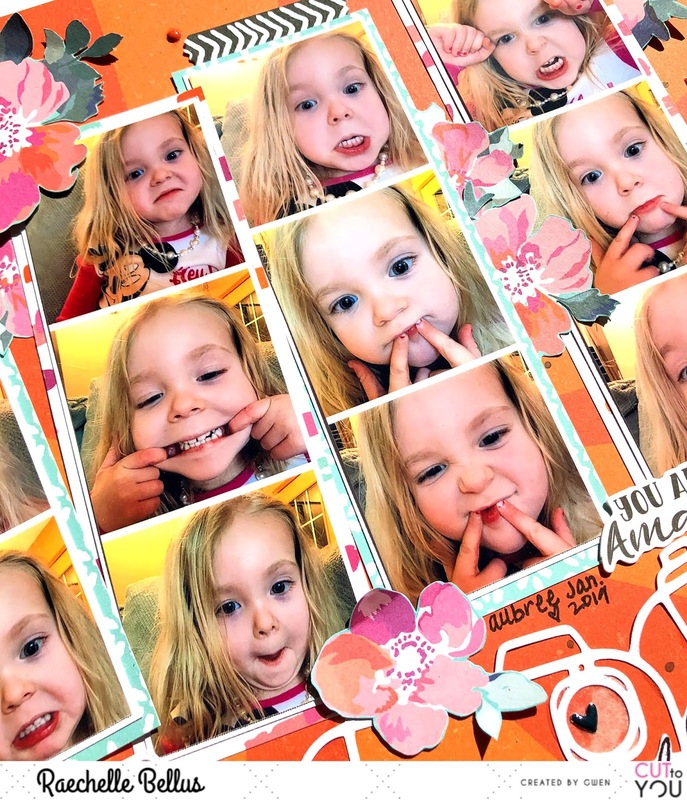 Adding a few fussy cut flowers, a bit of mist and some enamel dots finishes off this playful page and maintains the focus on these silly faces from my granddaughter. Thanks so much for stopping by! 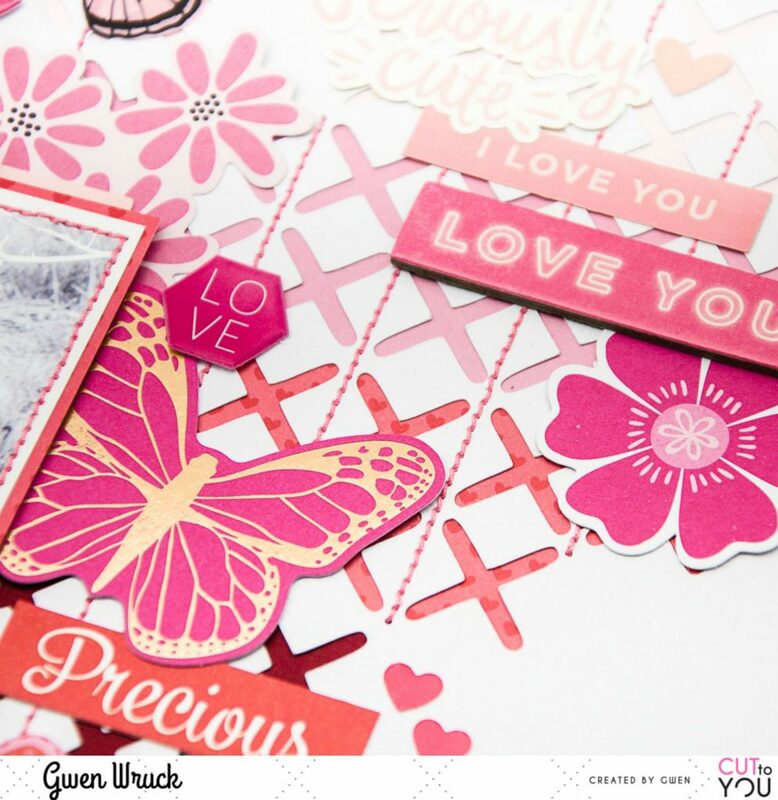 Please do pop on over to the CUT to YOU HQ FB group, we love seeing what you create with Gwen’s beautiful creations and it’s a fun place to gather! Hey everyone and welcome to the CUT to YOU blog today! 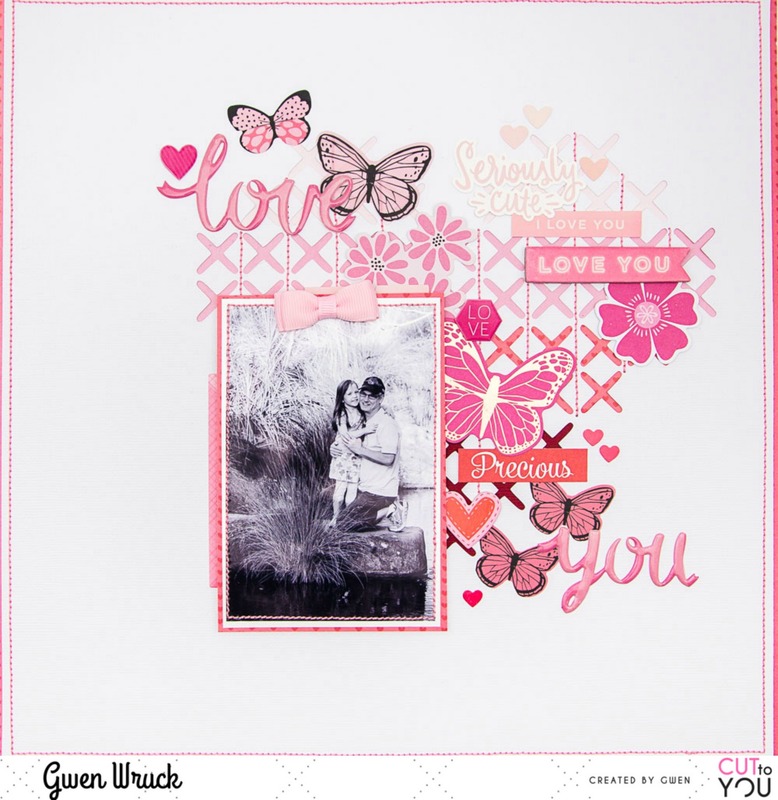 I am so excited to be here sharing on the blog for the first time with my latest creation for CUT to YOU! I have used an “older” cut from November called Title Bouquet. As soon as I saw this file I knew I wanted to make it BIG and fill that middle area with a kind of panoramic picture. I cut this gorgeous cut file on a busy and bright pattern paper for something different and after trying it on white, grey and black I settled on the black cardstock back ground. I just love the way the cut file jumps off the page and it such a beautiful feature. Before I did anything else with the cut file I sprinkled gold mist all over my background and popped that aside to dry. While that dried I adhered my big photo into the open rectangle and added some white machine stitching. I popped up the photo on some dimensional adhesive and then got to work on my title. I have used dimensional adhesive behind my letters as well and then stuck that big cluster as one piece. I have only used adhesive where the dimensional adhesive was applied and have not stuck down the outer leaves and details. I created a smaller cluster to the bottom right of the page including the rest of my title and some scraps of paper from the same collection I cut my cut file from. I’ve added in some stitching to the bottom cluster as well. I finished out my page scattering some enamel dots all around the page. I have created a process video for you today and it includes the process I followed in Silhouette Studio to get my file cut and how I “designed” my page as well before I cut anything! I’d love for you to check it out! I hope you enjoy! I really had a lot of fun putting this page together and it was actually quiet quick! Why don’t you try creating a page with a giant cut file and let that shine?! 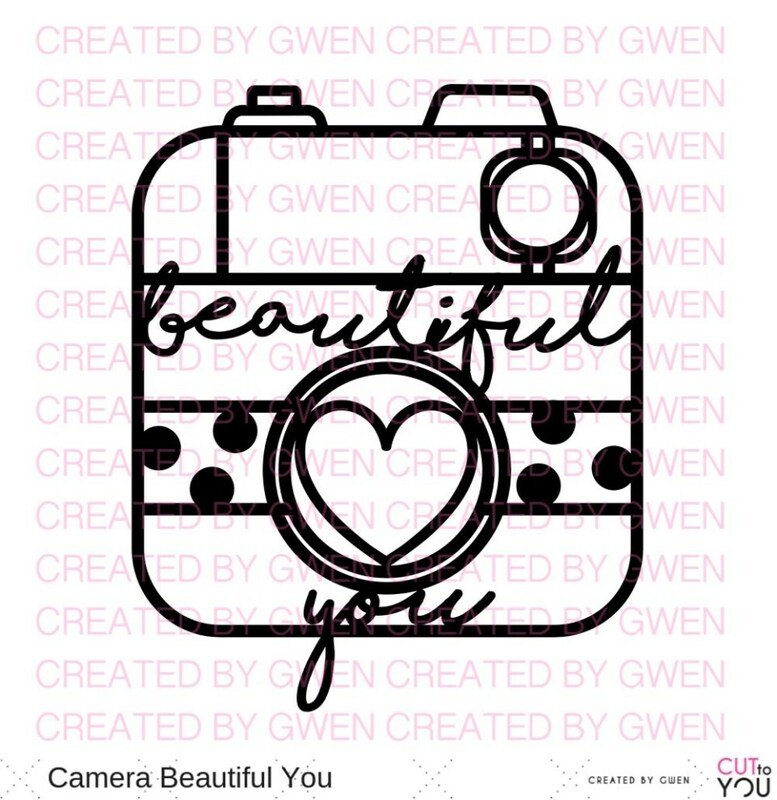 Please make sure that whatever you create with any of the CUT to YOU designs you pop on over to the CUT to YOU HQ FB group, we love seeing what you create with Gwen’s beautiful creations!! It’s Gwen on the blog today. I hope you are all well! I have a new share today, and I’m pretty excited about it because it’s my first scrapbook page using the new ‘Stitch’ inspired cut files. It also happens to be another monochromatic layout. I was super inspired by the monochromatic layout I did recently for Cocoa Vanilla Studios, I wanted to do another! For this one, I went all pink! Here is the cut file I’ve used, as I mentioned, it’s from the Stitch inspired collection and it’s called Stitch Geo Heart. The idea for the design of the page was inspired by the cut file and this darling picture of my husband and daughter from a few years ago. I wasn’t sure where to start with the design, so I simply cut the digital cut file positioning the heart towards the centre of my page. I then went about backing it in strips of pink pattern paper to create an ombre effect. For a little more detail, I decided to add in some stitching on my sewing machine between the rows of cross stitch and I just love the effect it creates. Next, I mat my photo with some red pattern paper and added some more of my signature stitching. 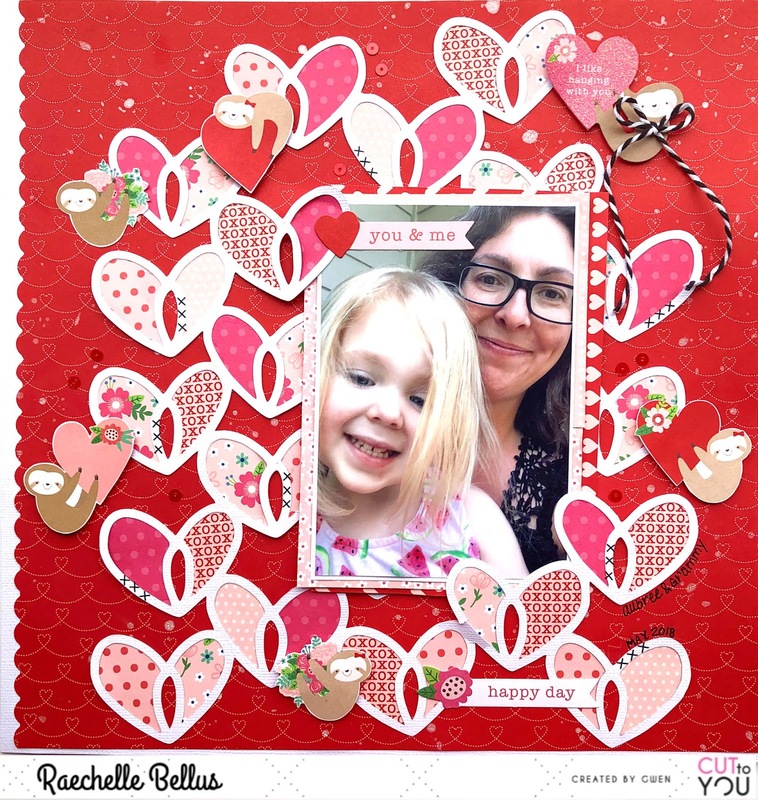 I positioned the photo onto my layout, to the left side of the heart, I love how the heart adds interest and layers to the background without adding bulk. It also looks like I’ve gone to a lot of trouble to create it when really it was very quick and simple. Next, I went digging through my stash of red and pink embellishments, I’ve pulled out all sorts of things from many different collections. I’ve also gone with a wide range of tones, from a soft baby pink right up to a bright red and dark pink. To stop the layout from looking too busy, I’ve kept the colours together in their colour families and matched them to the background ombre using the tone on tone technique. I just kept adding bits and pieces until I was happy with how everything looked. I’ve also repeated the sentiment “Love You” to pull the page together. When my daughter looks back on her scrapbook albums the over-riding message I want her to see is just how much she is loved and I think this page really conveys that! As always, be sure to pop by our Facebook group (if you haven’t already) – CUT to YOU HQ for more inspiration from the design team and lovers of our files. We also love to see what you make with our files. 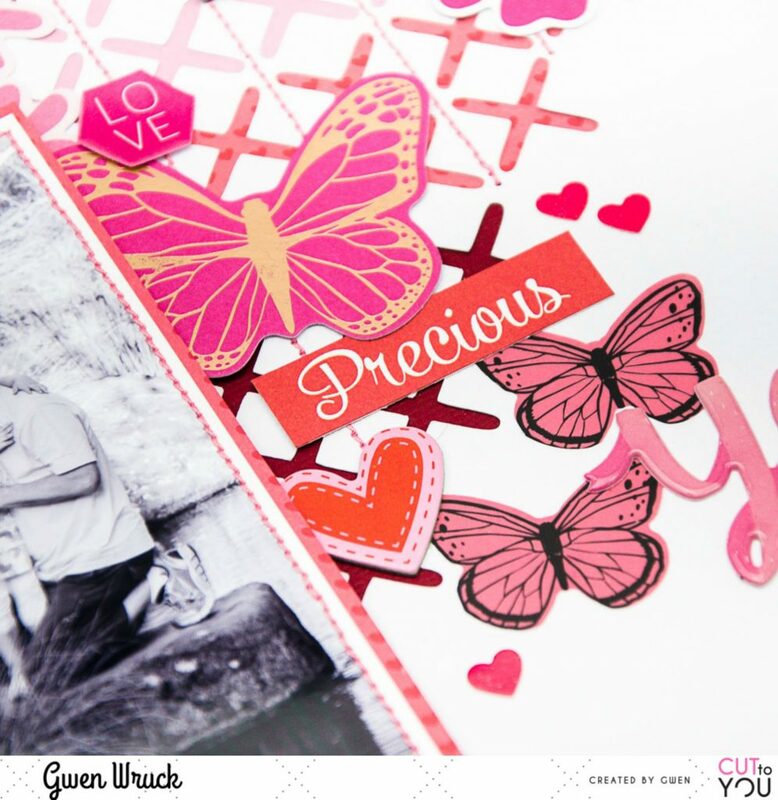 Rachel with you today for my first share on the CUT TO YOU blog! I have a page in my new TN to share with you today. up getting too far behind! TN 2019 Best Yet cut file and some washi. so I didn’t want to cover them up too much. really jumps off the page. I have used the TN Currently cut file on the left hand side. to create a drop shadow. I then backed it with some lilac paper and outlined with blue pen. then cut it into smaller pieces as embellishments on both sides. right hand side under my photo. journalling, doodles and some splatters. Head over to the shop to check out what’s new. There are some gorgeous cuts in the latest release! I’m excited to be sharing with you over on the new CUT to YOU blog today. This page is a little different to the bright colourful layouts I’ve been creating lately, but it’s good to shake things up from time to time! I used the XOXOXO Cut File that was released in February in the new Travellers Notebook range. I really wanted this Cut File to have a lot of impact, so I increased its size to work on a 9×12 layout and cut it out from black card stock. In order get the effect of this being a cut out in my background, I had to use what is essentially the negative of the Cut File (or the bit you would normally through away) and add back in the tiny centre pieces. I worked on emphasising the impact of the Cut File by backing it with a simple black and white patterned paper, and then added in a heap of messy white stitching. By using the Cut File this way, I was then able to use the main piece of the Cut File amongst the many layers backing my photo. I then added in some various other bits and bobs, a few splatters on white paint, some alphas and puffy stickers, and then it was job done! As always, the awesome Cut File has done most of the work for me! Thanks for stopping by today. Make sure you jump over to the shop or to our FB group to share your creations. Hello lovelies 🙂 I am so excited to share my first project as a designer for CUT to YOU! 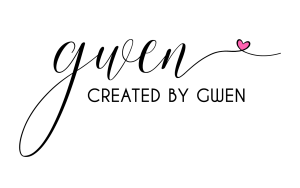 I used the lovely Heart Burst Background Cut File. 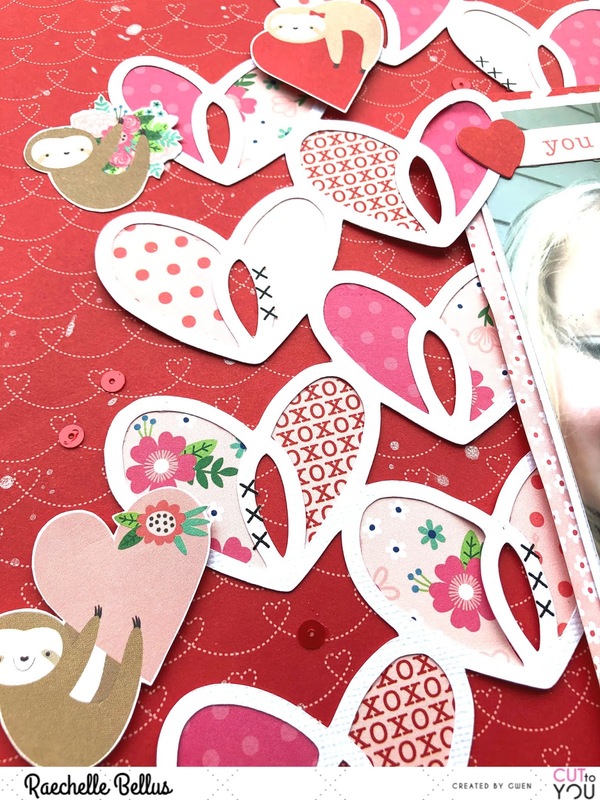 I used several patterned papers on each side of the heart and scattered them leaving the centre area open for visual interest. I carefully snipped a few of the hearts away from the cut file so they could be layered upon the photo to add some extra dimension. Adding a few fussy cut sloths (which are adorable! ), some rub on decals, along with a sprinkling of sequins finishes this layout off perfectly. If you haven’t checked out all the AMAZING cut files that are available at the CUT to YOU store, then what are you waiting for?! There is something for everyone. I look forward to seeing what you create with them… you can do so by joining the CUT TO YOU HQ page on facebook. P.S. 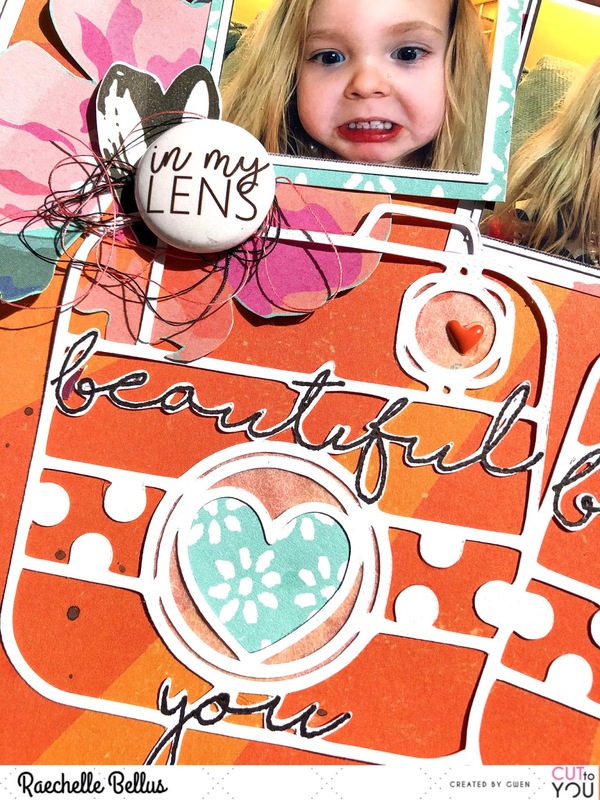 This month CUT to YOU is sponsoring The Happy Craft Challenge. Head on over there to see how you can join in. 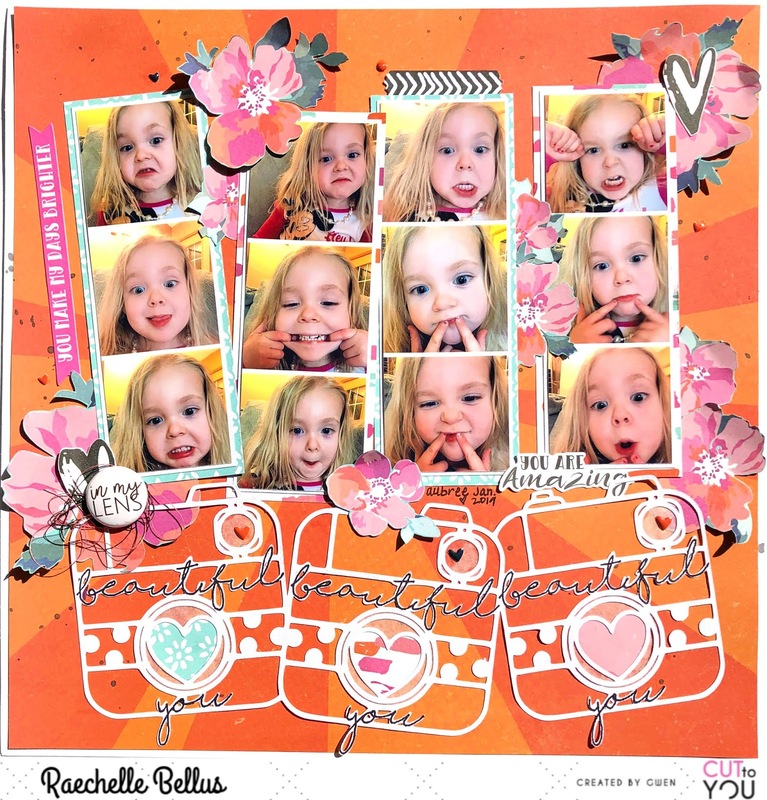 I thought I’d pop by today to share some tips on using our digital cut files. I do get a few questions, especially from those of you who are new to cutting the cut files so I’ve put together this quick step by step to help. Your cut file will be received in PNG and JPG format and can be used on any electronic die cutting machine. Most machines will prefer you use the PNG file. Simply open your software and select NEW. Next, find the location of your saved file and IMPORT. Use your TRACE tool to trace the image and prepare for cutting. Resize and position as required and send to your machine. Add to your project to make it beautiful! For SVG files, which are most commonly used with the Brother Scan & Cut machine, please visit our ETSY store, CUTtoYOU. I personally have a Silhouette CAMEO 3 Machine and will put together a step x step tutorial for that machine for you coming soon. I’m Gwen Wruck, I live on the beautiful Gold Coast in Queensland with my hubby who happens to be a pro-photographer and daughter Caitlin, the most photographed child on the planet! I started scrapping in 1998 and still absolutely love it. I have worked on many design teams and am currently designing for Cocoa Vanilla Studios and Scrap the Girls and love showcasing products, sharing ideas and connecting with the scrap community. I have enjoyed having articles and layouts published in Scrapbooking Memories and JOT magazines and am thrilled to be a Scrapbooking Memories Master for 2017. I also teach at a local store The Stampers Hut AND I’m the owner and Chief designer of CUT to YOU!! All of which keeps me very busy! Check out Created By Gwen for more. Hi, I’m Tamara, a 30 something wife and Mumma to two not-so-little princesses. 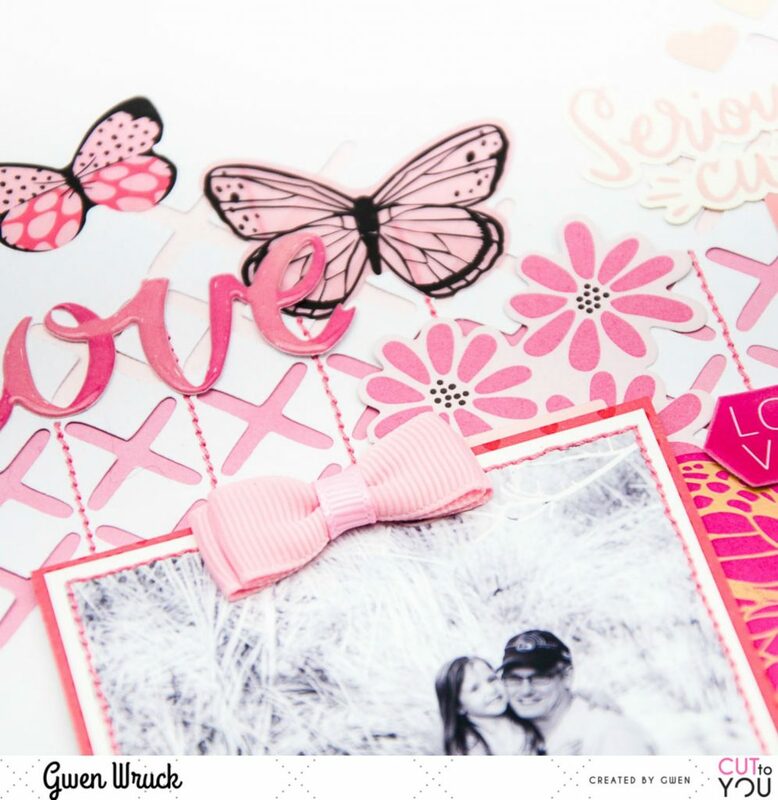 I have been scrapbooking for around 15 years and love it more today than ever! I would say my style is ‘girly-grunge’ and my layouts can swing from either end of this spectrum. I love to make messy and textured layouts, but can also rip out some paper pieces and pretties and be equally happy. I look forward to sharing my CUT to YOU creations with you! I am a mostly SAHM to my 2 little boys in Perth. I also am a group coach for Weight Watchers and some days I couldn’t tell you which “job” I love more! I am lucky enough to be married to an incredibly supportive and loving hubby who, minus the occasional eye roll, supports me in pretty much everything I do! I love to get messy and play with new products. 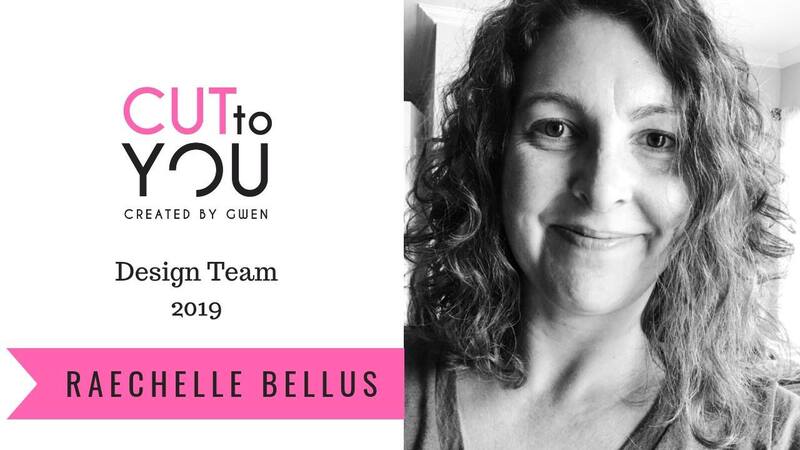 I also love the little thriving Aussie community of scrappers and am so thrilled and excited that Gwen asked me to be a part of her team here at Cut To You! I love Gwen’s style and can’t wait to play and add some pretty’s to my albums!! Melinda’s blog is here and her YouTube channel is here. Hiya, my name is Bernii Miller and I have been around in the scrapbooking community for the better part of 16 years. Over those years I have dabbled in all sorts of memory keeping from traditional 12 x12 layouts, project life and now my new love travellers notebooks! You will mainly see my two kids Abigail and Hunter, who have now learnt it’s easier to smile for the camera straight away than be hassled by me until they do! My style has changed over the years but I always tend to go back to bright colours, florals and watercolours. They seem to be my jam. Over the years I have been lucky enough to be on many design teams, and many moons ago ( 2013) my scrappy dream came true and I became a Scrapbooking Memories Master. I am so excited to be joining Gwen and the team !! Bernii has a fab blog here. 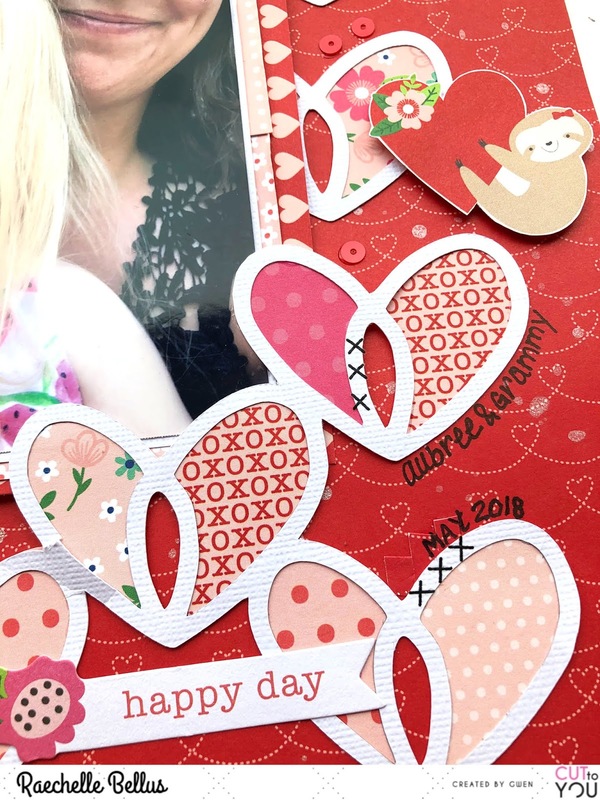 My name is Rachel and I live in Adelaide with my husband and our 2 young boys, who are the inspiration for the majority of my scrapbook pages. I first started scrapbooking about 12 years ago, but after a big break, I rediscovered it with a life-changing passion about 4 years ago. I love using mixed media, texture, and learning new creative techniques and growing as an artist. I think my style is fun, bright, and sometimes messy, ‘boy’ pages. I mostly create 12×12 layouts, but I also like to create cards, tags, art journal pages, canvasses and OTP projects. 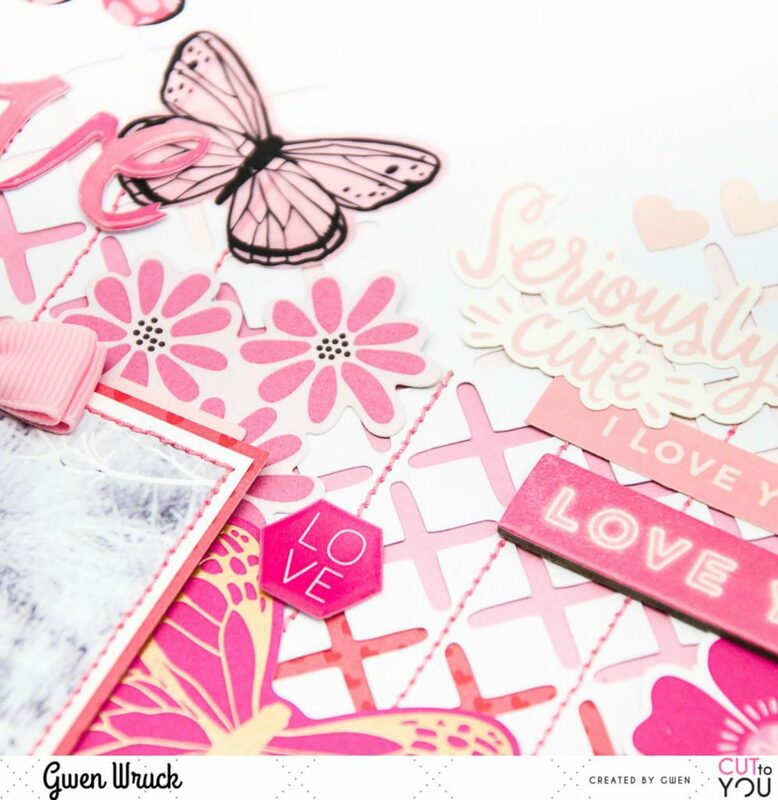 I am so excited to be asked by Gwen to join her team as I love the look of cut files but don’t own an electronic die cutting machine, and CUT TO YOU is the perfect answer! Rachel’s blog is here, be sure to check it out. Hello! I’m Raechelle (pronounced Rachel) and I live in the state of Kentucky in the USA. I have been scrapbooking for around 16 years and greatly enjoy sharing this creative process with others who share the passion of paper. My style is primarily girly and my go-to’s are cut files and fussy cutting along with light layers and dimension. My sweet granddaughter is the primary focus of my layouts, although I have plenty of subject matter as we have a large blended family of six children (all who are adults and have left the next with the exception of our youngest who is in the “finding her wings” phase) as well as a cat and a dog. I am an avid reader and enjoy spending time outdoors as much as possible. I am delighted to be a member of the CUT to YOU team and am looking forward to sharing inspiration with everyone! AND there you have it, our talented design team, be sure to pop by and check out their blogs and seek them out on our Facebook group, CUT to YOU HQ they all share their work there and you’ll love their creations.